American power metal band REVERENCE, featuring Todd Michael Hall (RIOT, JACK STARR'S BURNING STARR), Bryan Holland (TOKYO BLADE, ARREST), Steve “Doc Killdrums” Wacholz (SAVATAGE, CRIMSON GLORY), Pete Rossi (OVERLAND, SANXTION) and Michael Massie (OVERLOADED, INNER RECIPE), premiered a new video for the band's new full-length album's title track, "Gods Of War". Check out the "Gods Of War" video on KNAC.COM right HERE. 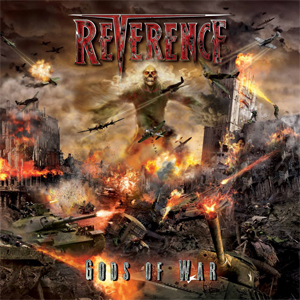 REVERENCE’s second album Gods Of War follows their first release, When Darkness Calls, which was released through Razar Ice Records in 2012.